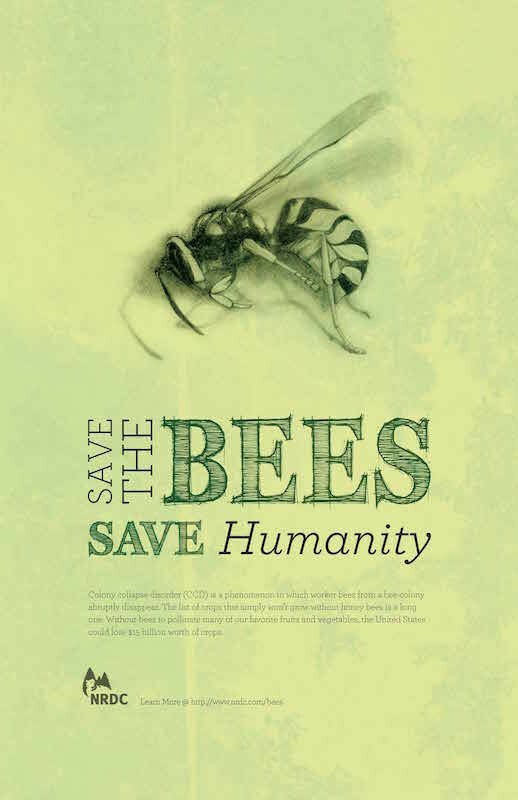 I’ve used this poster in talks a couple of times to make a distinction between colony collapse disorder (CCD) in the US and colony losses due to disease in the UK. It’s a rather striking poster … although it carries the website address www.nrdc.com (which appears to belong to the National Realty and Development Corp.), the logo and the subject are much more likely to be associated with the Natural Resources Defense Council (www.nrdc.org). Whatever … the message is clear, without bees there will be pollination shortages for many important and valuable fruit and vegetable crops. The term CCD, a still incompletely understood phenomenon where hives are abandoned by workers, was first used in 2006 in the USA and similar types of colony losses have been reported in a number of European countries, though not in the UK. Prior to 2006 there were a range of other names given to apparently similar phenomena – spring dwindle, May disease, fall dwindle disease [PDF] etc. The ‘Save humanity’ statement possibly refers to the the apocryphal quote attributed to Albert Einstein “If the bee disappears from the surface of the earth, man would have no more than four years to live” … though it’s highly unlikely Einstein ever actually said this. It’s also a rather questionable statement. Certainly honey bees provide important pollination services, but so do many other insects (and not just insects). There are certain crops for which honey bees are important – such as almonds – at least on the scale they grow them in California. However, on a visit-by-visit basis, honey bees can be relatively poor pollinators. For examples, solitary bees such as Osmia sp. are much more efficient pollinators of apples. The inefficiency of honey bees is more than compensated though by their numbers and our ability to move hives to crops that need pollinating. This entry was posted in Beekeeping, Talks and tagged almonds, apples, health, pollination, save the bees, wasps on February 10, 2016 by David.